The German-made M5Xi series features world-class engineering and optical systems, built to strict military specs and precisely crafted for victory – on the battlefield, or in competition. The 1-5x is for marksmen rifles, patrol rifles and AR/M4 platforms, with true eyes-open 1x magnification, and 5x zoom to locate targets at longer distances. provides maximum range at the high end, wider field of view at the low end and eliminates any tunneling effect. is easy and accurate for repeasted accuracy, with tactile click-by-click feedback you can hear and feel. M5Xi Military 1-5x24 is rated 3.3 out of 5 by 3. Rated 5 out of 5 by fullassault from Great glass The glass in this optic is amazing, it's well built and has great illumination. 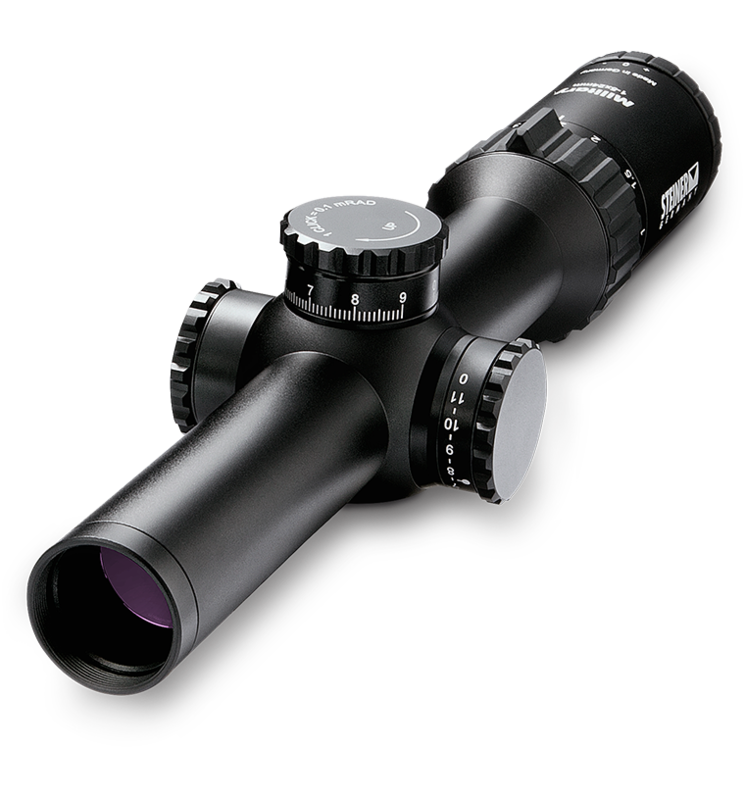 Rated 4 out of 5 by Scroder from Great Quality Scope So far I'm really enjoying this scope. Glass is very clear and the 1X is great. Only issue would be the slight bleeding of the red dot. Not sure if its normal or not. Will shoot some more. Rated 1 out of 5 by densanders from No illumination, Reticle crooked The illumination does not work. The reticle is tilted. Please contact technical services for assistance. 970-356-1670.
what bullet weights are the 5.56 and 7.62 calibrated for? In the video, what Mfg of rings and mount are you using? There are many different rings and mounts in the video. For the lifetime of the product, we will repair or replace the product at no charge to you if it becomes damaged or defective for any reason other than theft or deliberate misuse. No warranty card needed. No receipt required Warranty is fully transferable to future owners of the product. Is the M5xi 1-5 x 24 available with capped turrets? Currently the M5XI 1x5x24mm is not available with capped turrets. Only the exposed zero stop turrets are available. Will this scope mount on a SAKO 85 Grizzly? he question of who makes the 'best' throw levers is entirely subject to personal preference, but Switchview is one of the larger manufacturers of throw levers.